If we were having coffee, we would be sitting outside, enjoying the sunshine and green leaves. I love this time of year, and now that session is over, I can enjoy spending time outside with friends. Today’s e-mail update will be relatively short. I spent long days at the Capitol last week where we passed bills that I think will be very bad for workers. I will send an end-of-session wrap-up next week, but I wanted to give you a brief update today. I do want to point you to a new announcement about unclaimed property, because there is a significant amount of money that the state is holding for individuals in the 91st District. During the past week, the Governor’s criminal invasion of privacy trial was dismissed; the Cole County prosecutor declined to file charges against the Governor for lying to the Missouri Ethics Commission; and the House opened a special session for the purposes of disciplining the Governor. 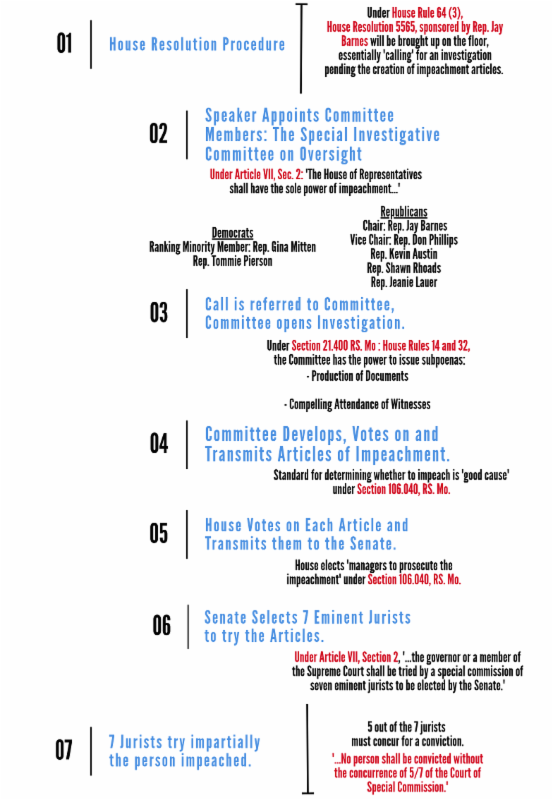 A note on impeachment: It is the House’s role to impeach for “crimes, misconduct, habitual drunkenness, willful neglect of duty, corruption in office, incompetency, or any offense involving moral turpitude or oppression in office.” It is our role as the Missouri House of Representatives to impeach if we believe, by clear and convincing evidence, he has done any of these offenses. This is not a criminal trial, and he can be impeached even if there is not sufficient evidence to send him to jail. If the House impeaches the Governor, the Senate will appoint a panel of judges and there will be a full trial to determine whether he should be removed from office. That trial is where the Governor will have the opportunity to present evidence and to cross-examine witnesses. A further note on grammar: Some of the confusion about what should happen is due to comma placement in the Constitutional provision and in the Statutory provision about removal. Commas are important! This year, the Legislature truly agreed and finally passed 148 bills. These bills will be sent to the Governor’s desk to review and sign. Some of these bills I agree with, including one that raises the age for an offender to be tried as an adult from 17 to 18. Others I strongly oppose, including several anti-union bills that will harm workers’ rights. I had a hand in several of them, including amendments to the blind pensions bill and to an elections bill. And many bills failed to pass, including a bill expanding the use of Charter schools and several provisions expanding guns in Missouri. This year, I again introduced an Employment First bill in the Missouri House. I also introduced an amendment to expand the availability of ABLE accounts to blind people. 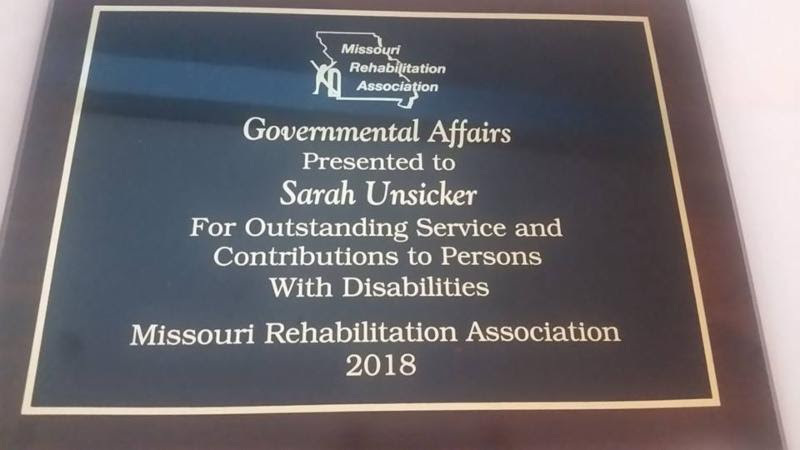 I am proud of the work I do on behalf of people with disabilities, and I am honored to receive this award. Capitol construction is well underway. I don’t believe any entrances have been closed due to construction, but they are more difficult to access. If you are visiting the Capitol, be aware of signs directing you where to enter the building. 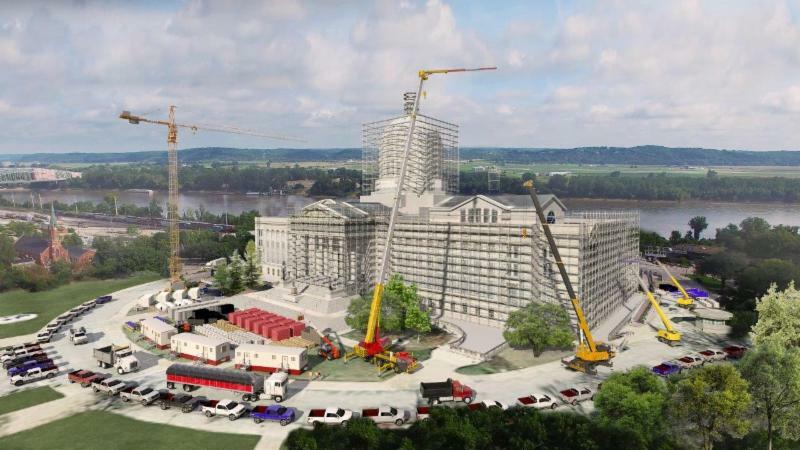 The Missouri Capitol will be under construction for the next two years. The streets around the Capitol are closed, with signs directing an alternate route. Construction is expected to be complete by the end of 2020. I am currently scheduling meetings in June to talk with constituents about the voting process and how to be involved with your government. If you would like to schedule a time for me to meet with you and your neighbors, please let me know by responding to this e-mail! I enjoy opportunities to meet with people in the community and participate in local events. It’s one of the best parts of my job! I got an e-mail from the state treasurer this week that “A review of my Unclaimed Property database indicates I am currently holding $8,477,703.64 belonging to approximately 43,570 account owners in your district.” There are only about 36,000 people in my district! You can recover any unclaimed property in your name by going to http://showmemoney.com. One of the priorities of the legislature this year has been legislation to help foster children. We have a crisis number of foster children in Missouri, and it has been rising due to the Opioid epidemic. If you would like to open your home to a child, you can find information about becoming an adoptive parent online at https://dss.mo.gov/cd/adoption/. The Missouri Bar has launched a new website, https://missouri.freelegalanswers.org/. This website will provide some legal answers for low-income people from trained lawyers, and also has resources for other legal assistance for people who need it. It is a resource for people who need legal help but cannot afford it. I will share events here that I am asked to share with my constituents.